We are a Proud Military Family with one son serving in the Army and the other served in the Marines. Marcia was a founding member of Marine Parents United, which went nation-wide with its conferences to help support, educate, train, uplift and love military families. Here is a PowerPoint slide show with music, celebrating its 5th year anniversary. God Bless our Military and their Families! We recognize that we would not have achieved any of our goals with out the help of our friends in the dog world and our mentors. Julie Speer of Splendid Goldens had enough faith to entrust us with one of her first puppies out of her first litter. That was our Angel. We can't thank Julie enough. Karen Mills of Patriot Gold and Cathy Gaca of Bearcreek Kennels helped us pick out Angel and then have offered invaluable information and instruction to help us along our journey. Cathy has been incredible with her support. Then, we learned so much from Julie Corral and finally purchased our 2nd golden from them, LoverBoy. Cortney has shown him to perfection and we have enjoyed this family so very much. They gave us a dream puppy in Dreamer when Angel died. We are so thankful for this friendship. Laura Kling of Laurell and Megan Strickland sold us Seraph and have been a wonderful support throughout her pregnancy and beyond! Judy Kahldal of Crystal Falls, Susan Still of Foxborro, Eileen Hackett and Kate, Karen Brady of Karagold, Lavada Martin of GFA and Barb Rollins have all been of great help. We have made many friends in Ohio, Indiana, Kansas, Iowa, Wisconsin, Maine, California, Texas, Kentucky, Florida, Michigan and Canada plus all our friends from White River GRC that I can not list them all for lack of space, but I do want to acknowledge how everyone has helped us along and has made us feel welcomed in the golden world. 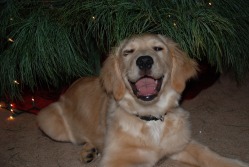 Please enjoy the following stories and pictures of our growing Golden Family. 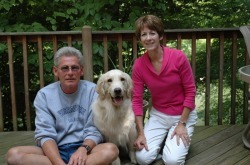 With heavy hearts, we have placed another beloved golden, our Wynn, into a very special home. I just didn't think it would be this hard getting started in goldens! Oh well, we continue to be blessed with wonderful "forever" homes for our precious goldens. Dan and Rita Shrader in Indiana, have welcomed Wynne into their home with open arms. It was "love at first sight" for Dan. 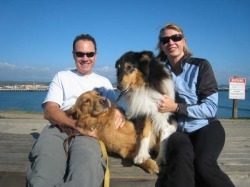 The Shraders just recently lost one of their precious goldens to a hard-fought battle with cancer and both the family and Apollo, their other golden, were sadly missing their friend. As things worked out, the Shraders were calling about an upcoming litter and told me about how their Apollo was depressed and how the family was suffering from this tragic loss. 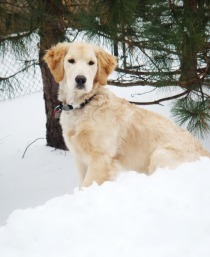 I had recently found out that Wynn was dysplastic, and felt we needed to find a special home for her as we just can not keep all our sweet goldens, as much as we would love to do so! Savannah needed a girl she could show. BUT, we were in no hurry to place Wynn and lo and behold, when the Shraders called, it just seemed like the right thing to tell them about Wynn. She is a great therapy dog! We love her and hope that the Shraders will be able to use her in therapy work after she has worked "her magic" on their broken hearts. I know she will! It is reported that she has truly made a connection with Dan, and they are true pals and Wynn sleeps at the bed and awaits for them to rise in the morning and enjoys nice walks on the lake side. I am at peace. We feel very fortunate to have this lovely family in our lives and more importantly, in Wynn's. Wynn's full name is Splendid's Wynsome Tyme in Clover. Golden Clover's Arwen of Rivendell. Golden Clover's Legolas Greenleaf of Mirkwood.